Click to read more on my review about He Red My Mind & Matte Top Coat Comparison! 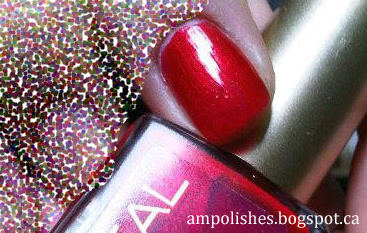 Red with a golden shimmer is quite a common combination but I still think it's pretty! I can't really wear shades like this which is a shame because this colour is really pretty! Fortunately my mom will be happy since bright reds is one of her favourite shades to wear. She never understands when I say I don't like how reds look on me since she calls them 'classics'. Anyway on to the pictures, not sure why but my camera picked it up more like a creme than a shimmer but I assure you, it's shimmer!! I tried to take a picture of the streakiness of some of the Matte Top Coats but not sure how well you can see them. I used arrows to pintpoint the areas.. 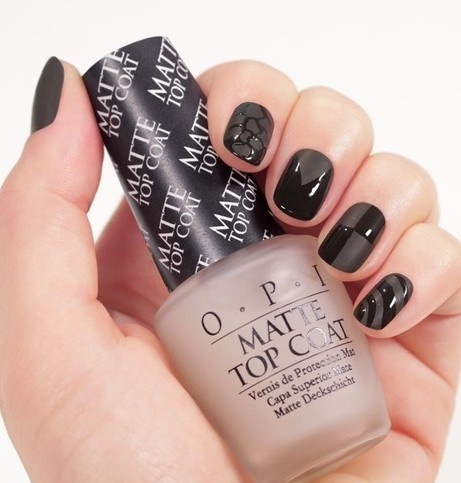 Some of the matte topcoats streak the base even though it seemed opaque before, boo! L'Oreal + Essie was the smoothest but the effect from all four of them were pretty similar. Not sure why but OPI had a bit of streaking near the tip and Warpaint Beauty's has major streaking. I haven't wore them for a while and I noticed that Warpaint Beauty's matte top coat was kind of separated which my beauty go-to girls said it was pretty normal?! Anyway, L'Oreal's Top Coat Matte preformed pretty well. I personally do like matte manicures and due to it's small size I might leave this with my travel manicure kit! Essie Matte About You is 15 ml and priced at $10.99. Essie is available at Shoppers Drug Mart, Wal-mart and various salons. OPI Matte Top Coat is 15ml and priced at $8.99 - $10.00. OPI is available at Target, various beauty supply stores and salons. Warpaint Beauty Mattify is 15ml and discontinued. L'Oreal Colour Riche nail colour is 11.7ml and priced at $6.99. L'Oreal Colour Riche Top Coat Matte is 5ml and priced at $6.99. They are available at most drug stores in North America.